Having missed out on the Great Northern Diver at Staines Reservoir yesterday, I had another go at lunchtime today. What a difference a day makes - both with timing and with the weather. The weather was shockingly bad - even more miserable than some of the other days we've had in recent weeks. Whereas yesterday morning was a day when you felt glad to be alive, today was one when it was an uphill struggle to stay that way. Bitterly cold, driving rain, a biting wind, charcoal-grey skies. And Staines Reservoir isn't one of those places you'd choose to visit if it wasn't for the birds on view. Thankfully, work commitments meant I couldn't stay long anyway. Timing is everything with viewing birds. Some stay in the same place for days or weeks, while others move around a bit - the Diver was one of the latter. There had been two birds on the south basin earlier in the morning but at least I could see one Great Northern Diver on view, although it had moved further away to the south and was only just visible due to the rain and chattering teeth. Being a Diver, it disappeared underwater for long periods, and then it decided to move on, so I got great views of the bird in flight. 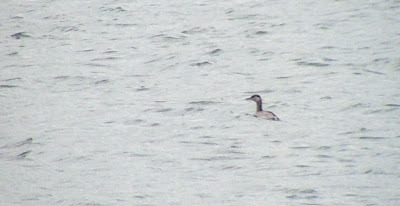 It flew closer but then banked and set off over to the KGVI Reservoir, where it landed. My hands were just too numb from the cold to pick up my camera to get a record shot. Maybe another time. 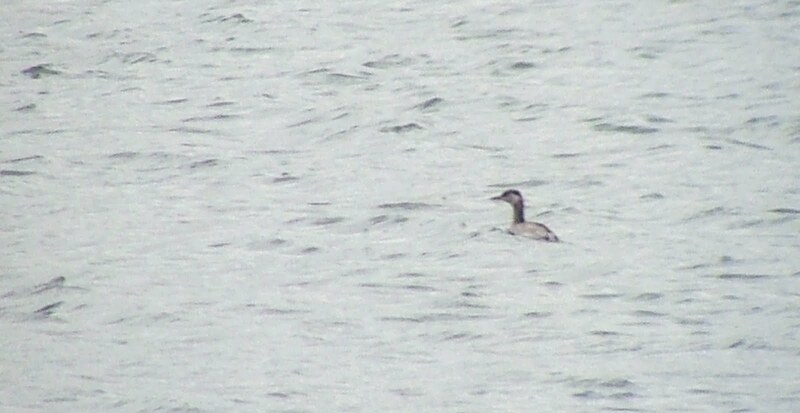 The unexpected bonus was a Red-necked Grebe, also on the south basin, which was close enough for me to get a picture. Back at Holmethorpe, a Curlew dropped in on Mercers West this morning, but it had gone by the time I went for a look at about 4pm.